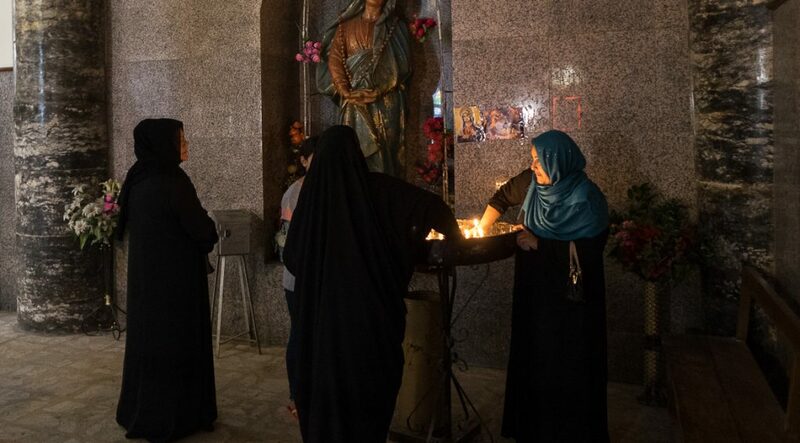 The Chaldean church Um-Al-Ahzan (Mary Mother of Sorrows) is located in Baghdad at 33°20’17.30″N 44°23’43.90″E and 44 metres above sea level, on the eastern bank of the Tigris River, in the Shorja district. 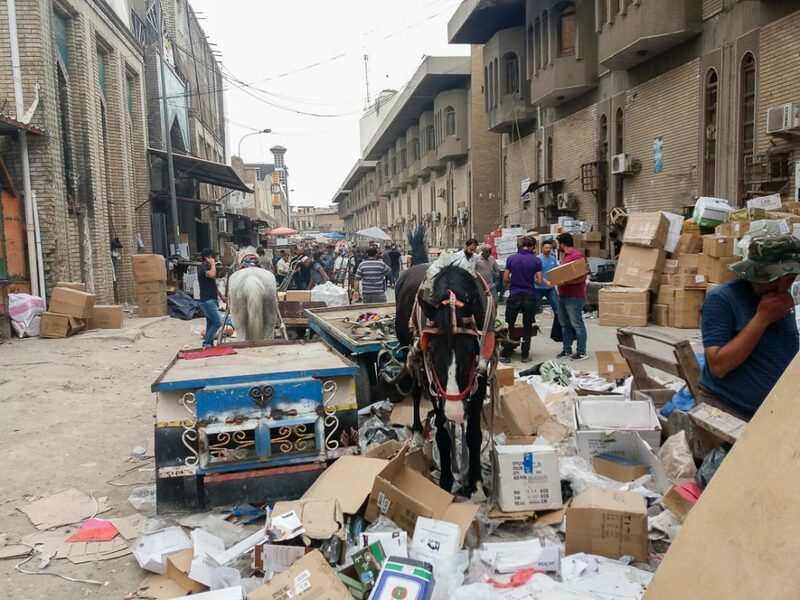 It is one of Baghdad’s oldest districts. The primitive church had been built in 1843. 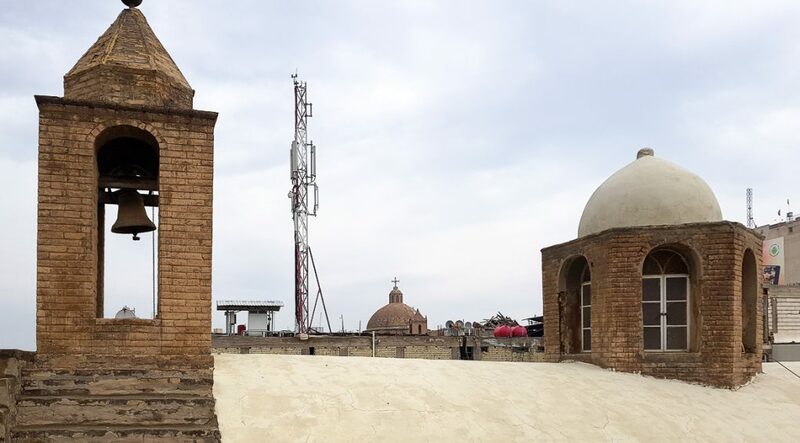 Erected on a low area of Baghdad, often flooded by the Tigris River and the rise in the underground water level, the church had to be rebuilt and enlarged 5 metres higher in 1889. 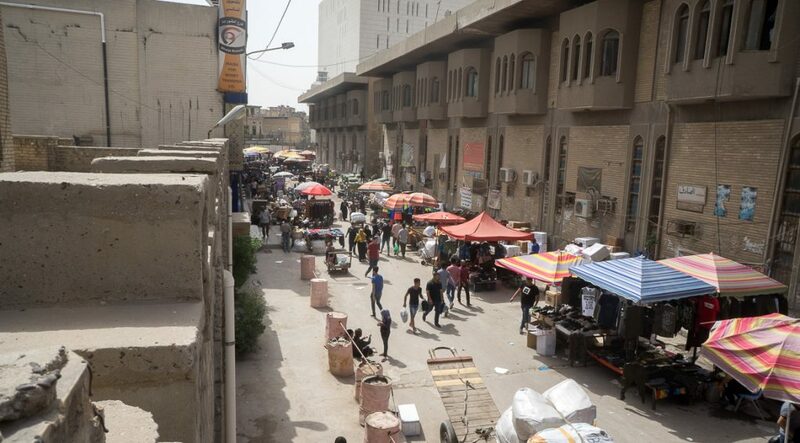 In the 1950s, the church Um-Al-Ahzan started to lose its influence as the local population was gradually moving away from this old district to a more modern area in Baghdad. 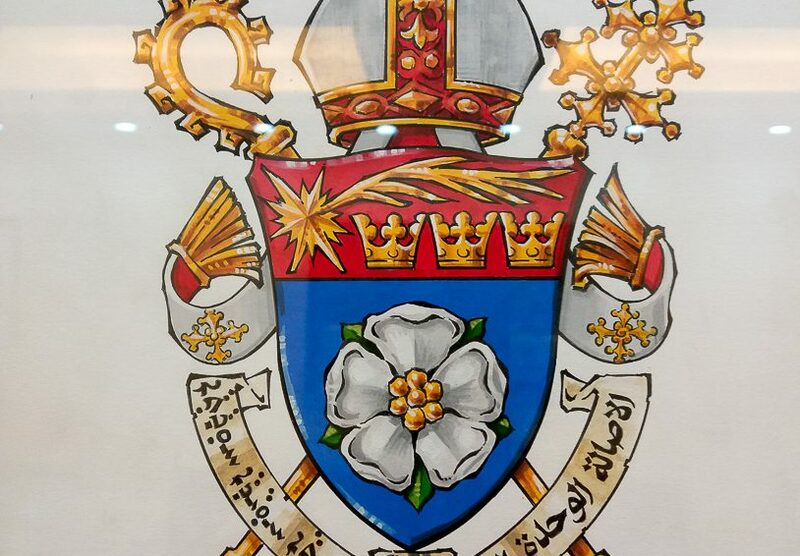 The church is called Um-Al-Ahzan, Mary Mother of Sorrows, as depicted on an outstanding painting hanging on apse’s wall. 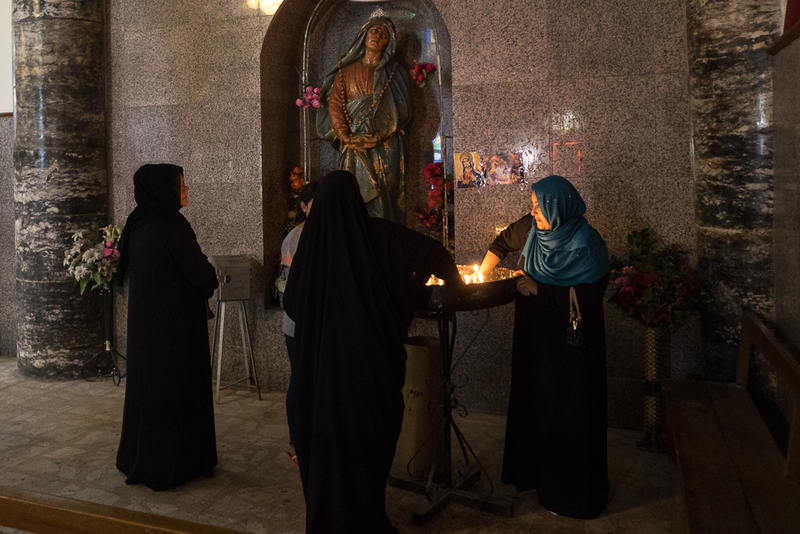 The Chaldean church Um-Al-Ahzan (Mary Mother of Sorrows) is located in Baghdad at 33°20’17.30″N 44°23’43.90″E and 44 metres above sea level, on the eastern bank of the Tigris River, in the Shorja district, in Aqd-Al-Nasara. 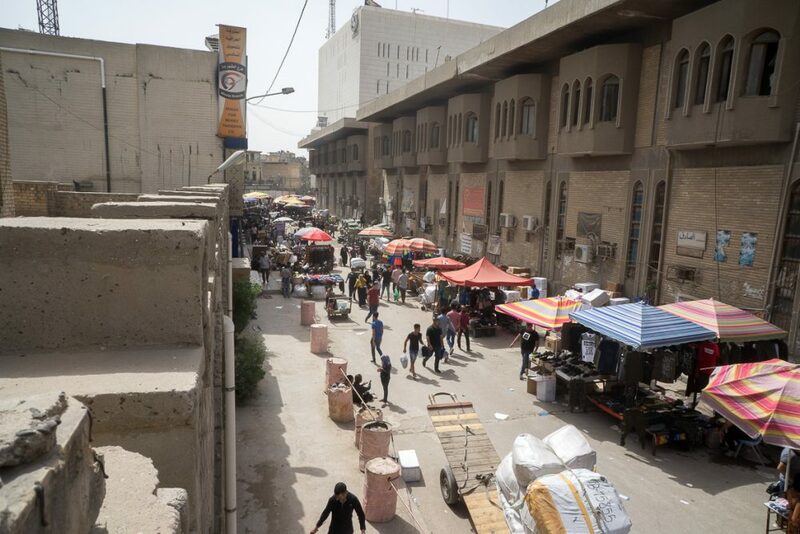 It is one of Baghdad’s oldest districts, where thousands of Christian families used to live in. 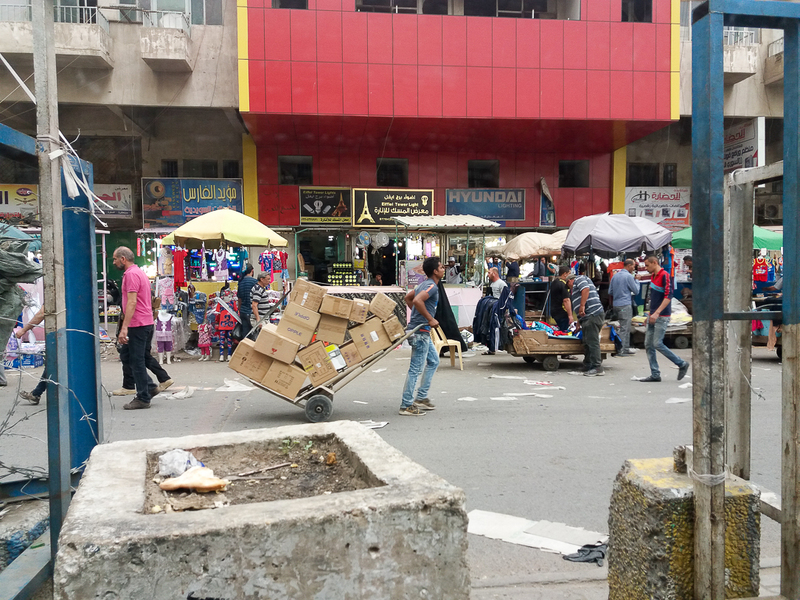 To access the church Um-Al-Ahzan, you need to go through a large market, where shopkeepers take all the available space, including along the church’s wall, when not even inside the church to store whatever could be stored in there. The estate property of the church Um-Al-Ahzan is very much coveted because of its central position with a strong business and shopping environment. 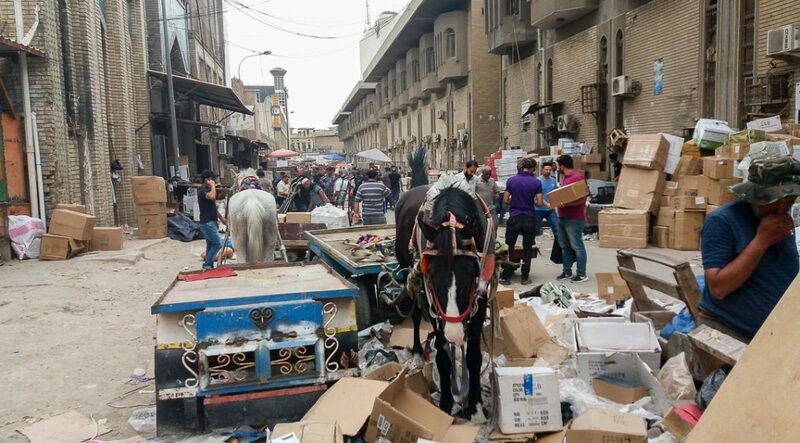 District Aqd al Nasra in Baghdad. April 2018. 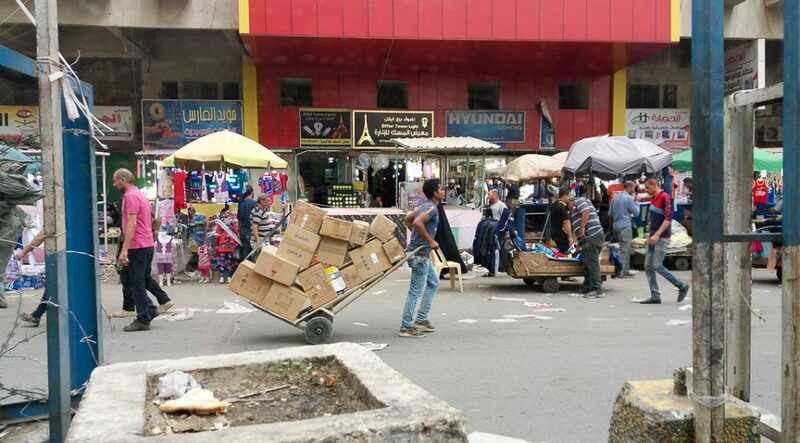 Street and market in front of the church Um-Al-Ahzan in Baghdad. 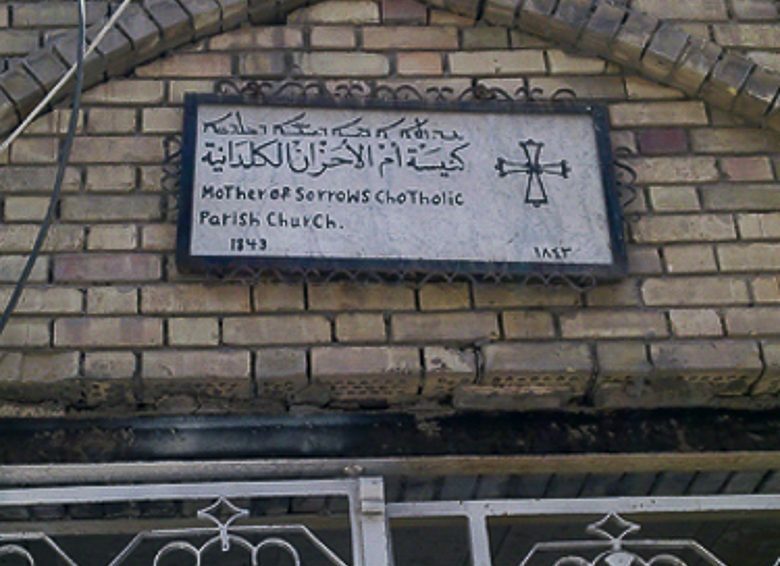 Since its foundation in 1843, this church is called Um-Al-Ahzan, that is to say “Mother of Sorrows”. 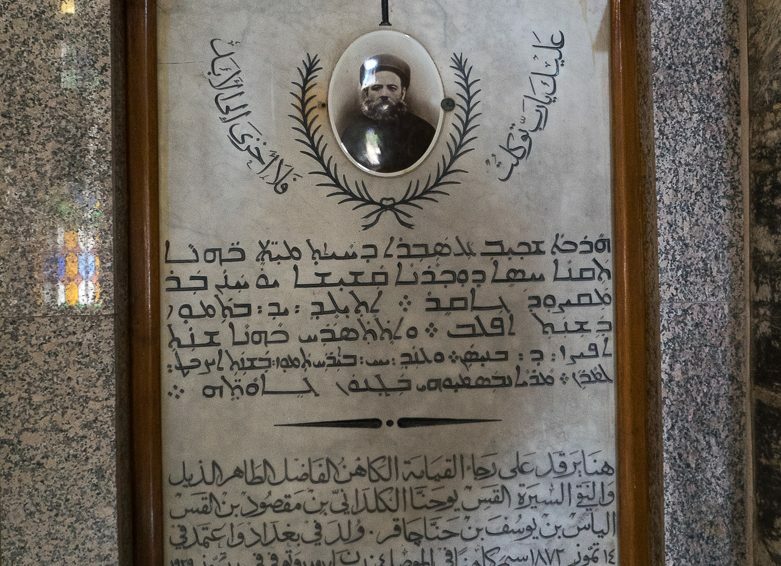 At the times of its reconstruction and consecration in 1898, Patriarch Mar Abdisho V Khayat kept this original name instead of naming it after the traditional apostles of the East (Mar Toma, Mar Addai and Mar Mari) as Patriarch Elya XIV Abbo Alyonan preferred when he laid the foundation stone 9 years earlier. 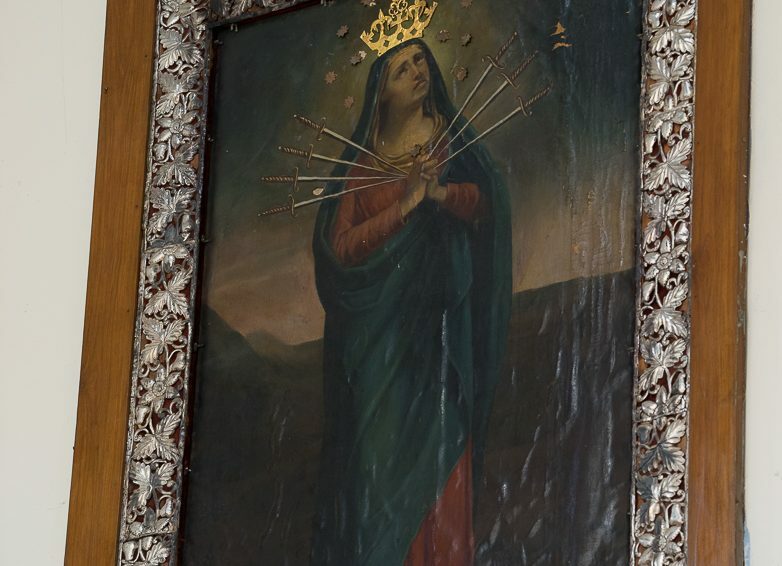 This naming is indeed being confirmed in an outstanding painting hanging onto the apse’s wall and representing the “seven wounds of the Mother of God”. 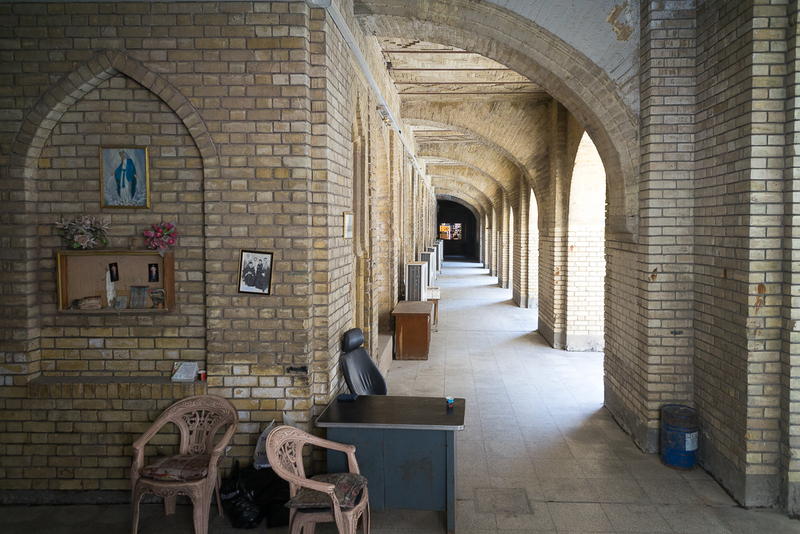 Entrance of the Church Um-Al-Ahzan in Baghdad. 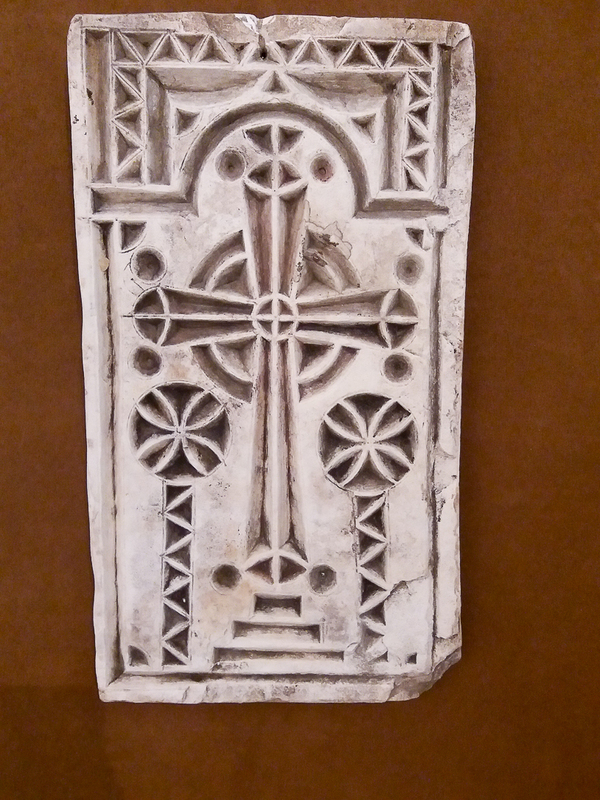 Assyrian cross from the Sassanid empire (3rd-7th century). 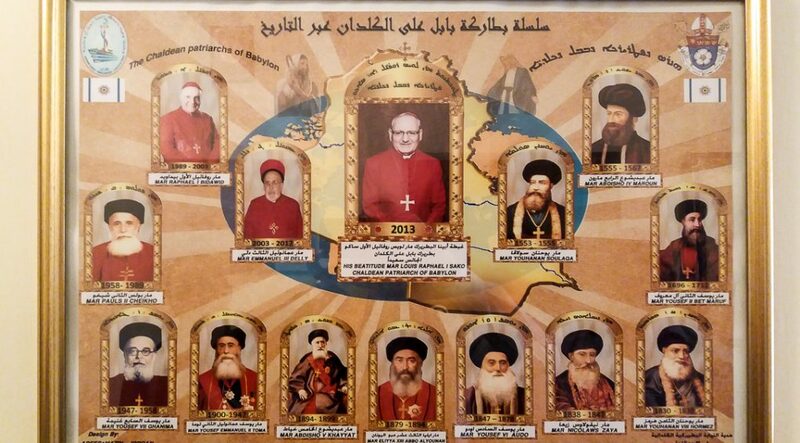 Chaldean patriarchs, from the beginning until today. 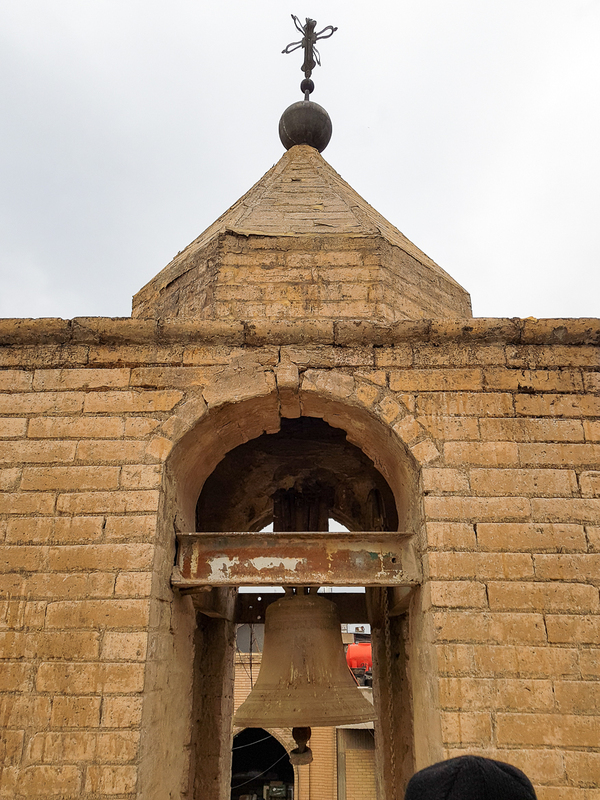 The primitive church Um-Al-Ahzan was built in 1843. 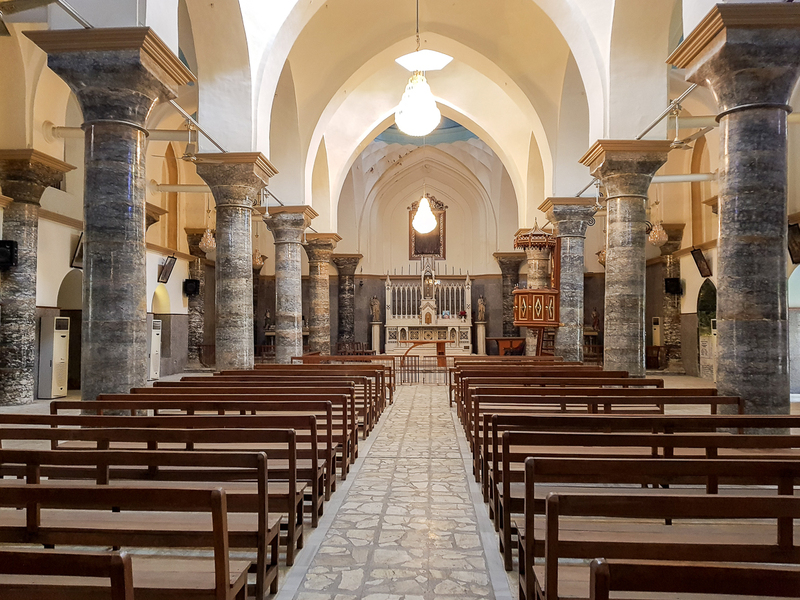 The ever growing population and the needs of the Chaldean community led to the building of a new and larger church at the end of the 19th century, that could sit around 2 000 persons. 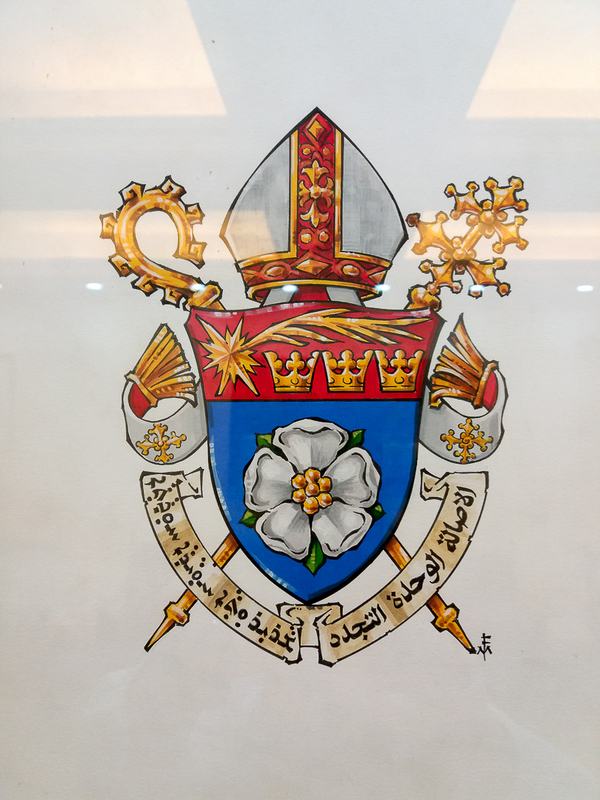 For the construction of this new church, the negotiations and steps were undertaken under the authority of the Chaldean Patriarch Yousef (Joseph) VI Audo, but were stopped when he died in 1878. Petros Elya XIV Abbo Alyonan, Patriarch of Babylon for the Chaldeans laid the church’s first foundation stone on March 17th, 1889. 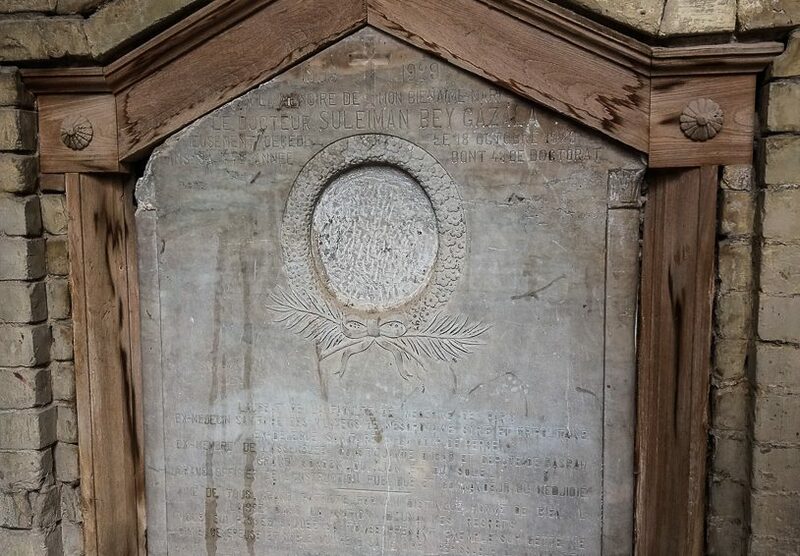 He died from typhoid on June 27th, 1894, before the church was finished. 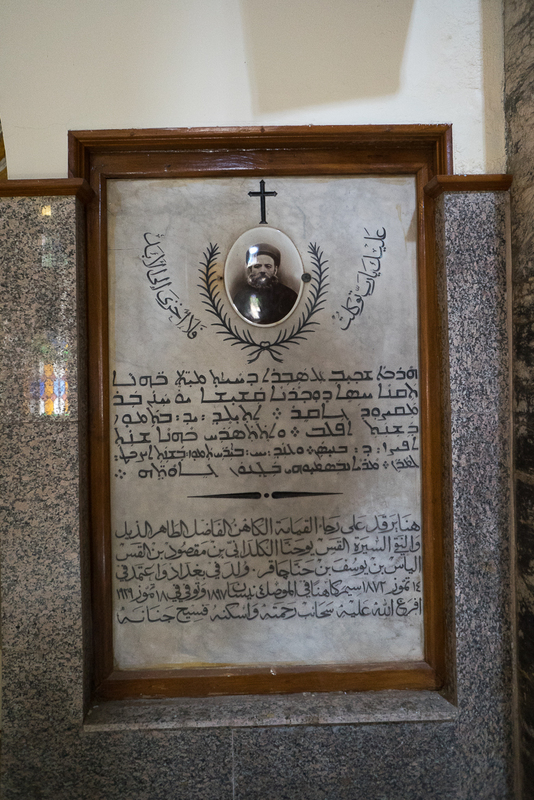 Mar Abdisho V Khayat succeeded him and inaugurated the church on November 27th, 1898. 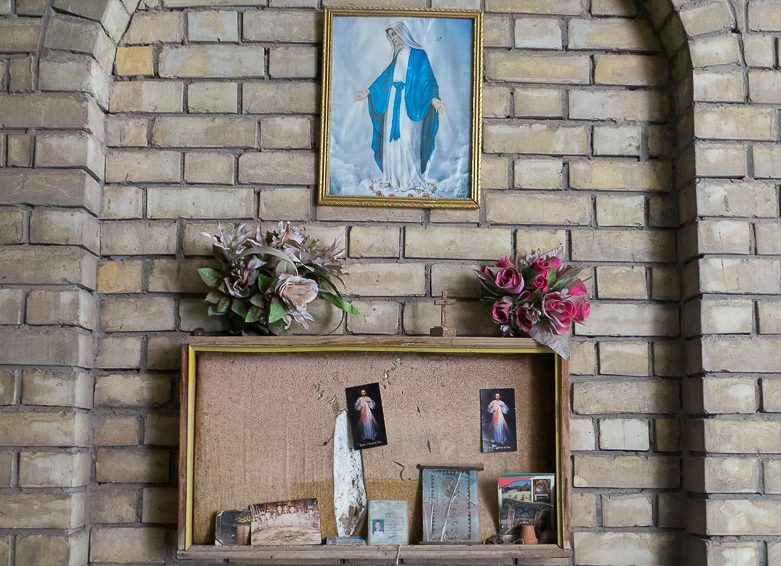 During the 1950s, the church Um-Al-Ahzan’s influence started to decline, with regards to the local population leaving progressively this old district of Aqd-Al-Nasra to move and settle into more modern areas of Baghdad. 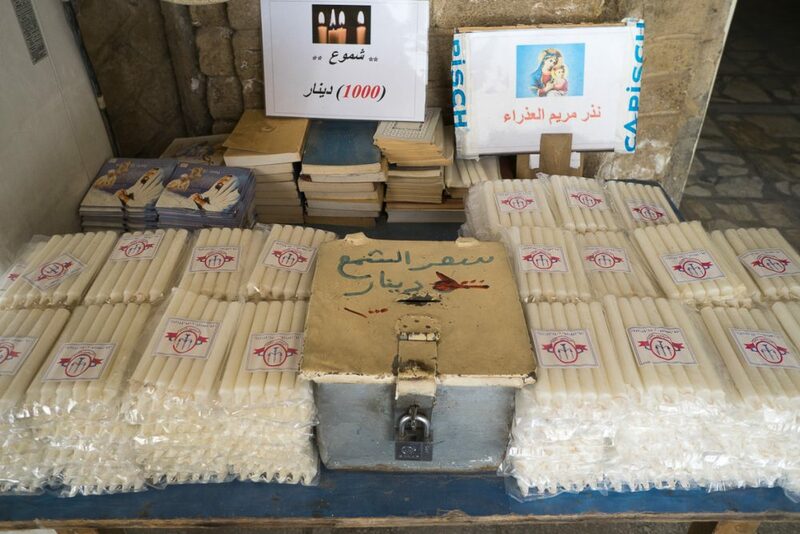 Today, there are only but 120 Christian families left in that district. 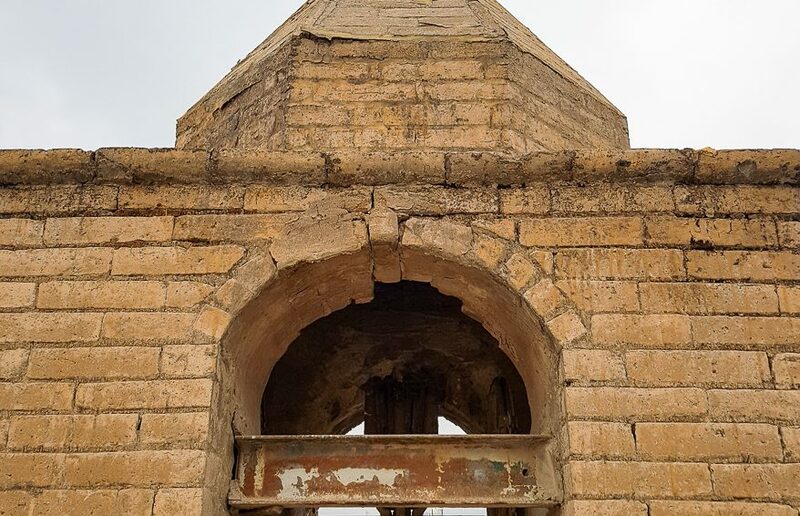 Erected on a low area of Baghdad, often flooded by the Tigris River and the rise in the underground water level, the church’s structure had weakened considerably. 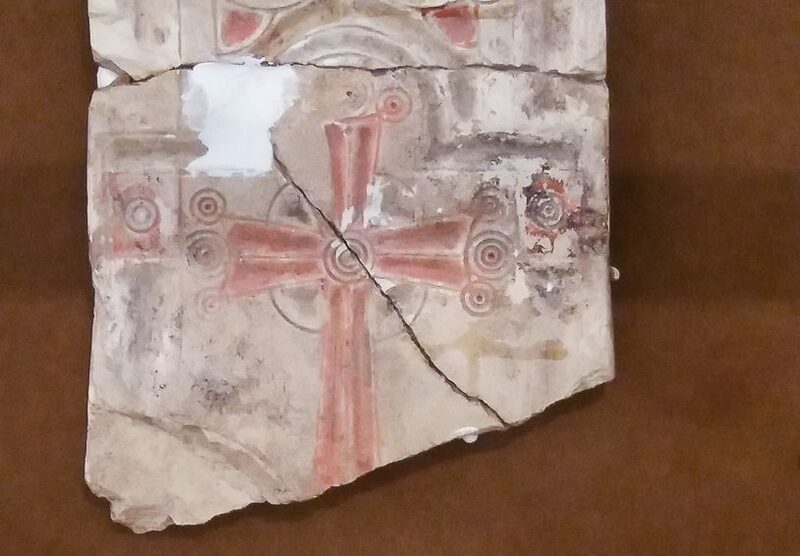 Patriarch Paulus II Cheiko started a big restoration programme. The church’s floor had to be rebuilt 5 metres higher in 1889 and a drainage system had to be installed. 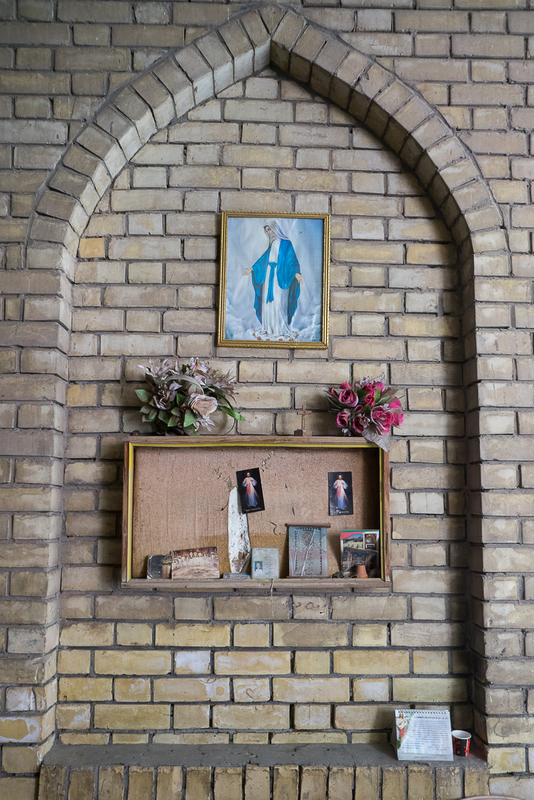 Although only few masses and services are celebrated there nowadays, the church Um-Al-Ahzan used to be the Chaldean cathedral for Baghdad. 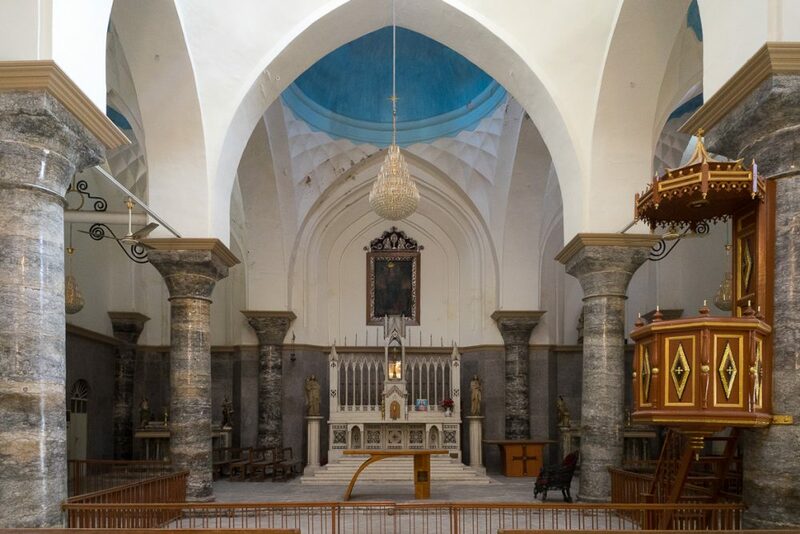 It has been completely restored and renovated by the Patriarch of Babylon for the Chaldeans Louis Raphael I Sako in 2015. 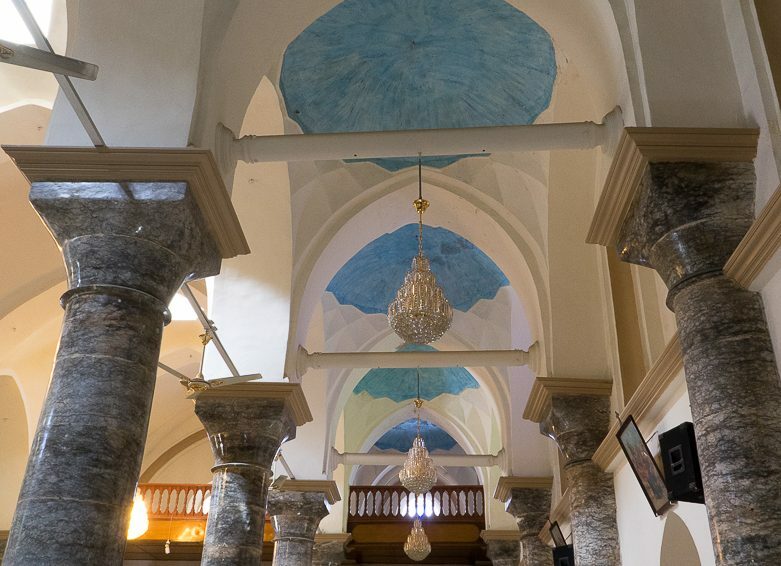 Church Um-Al-Ahzan in Baghdad. The bell-tower. 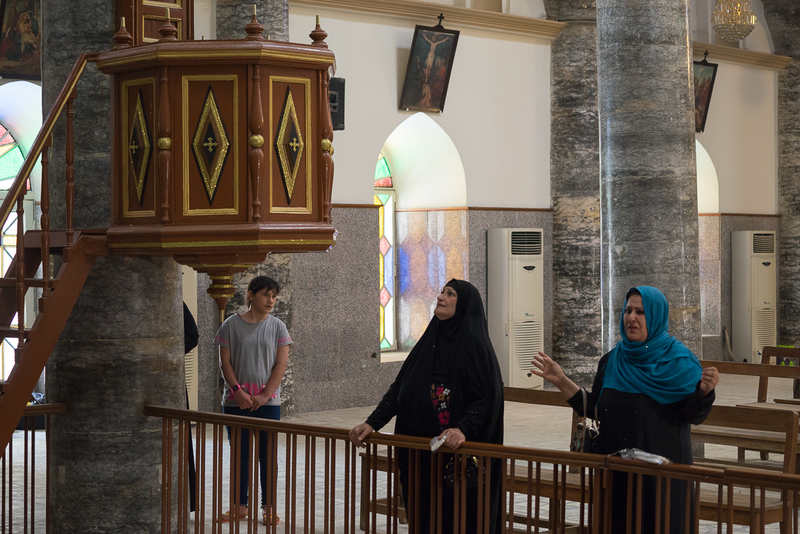 Church Um-Al-Ahzan in Baghdad. 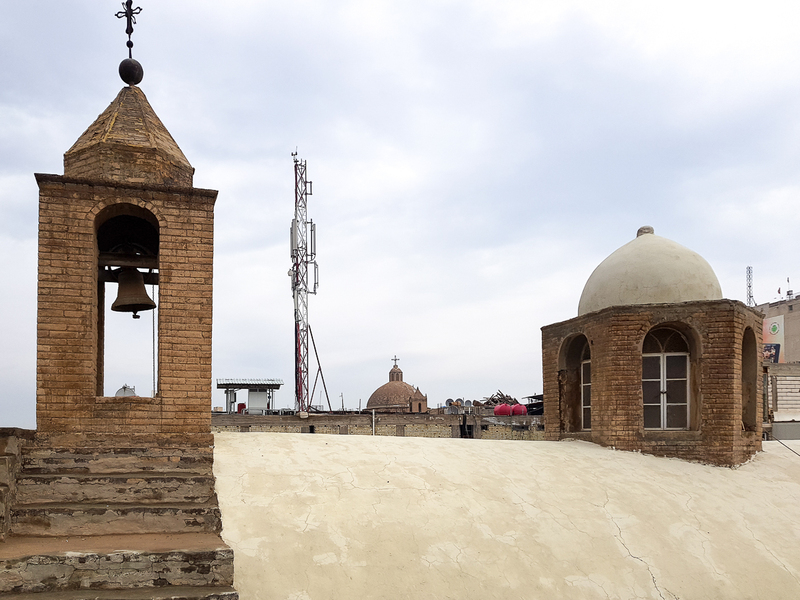 Bell-tower and dome. 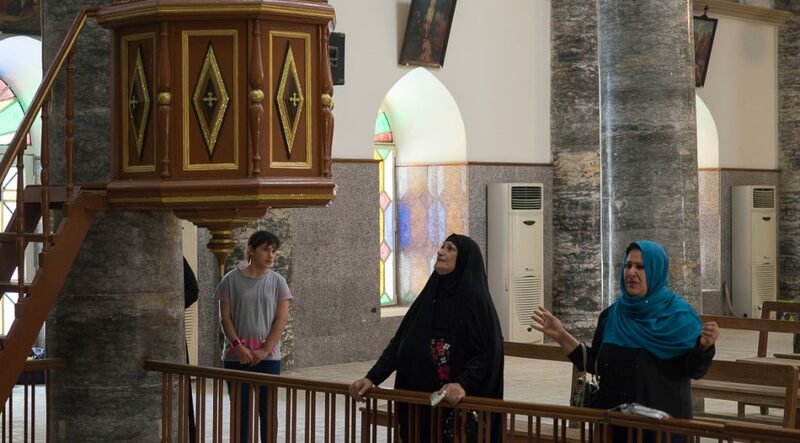 Church Um-Al-Ahzan in Baghdad. Southern facade. 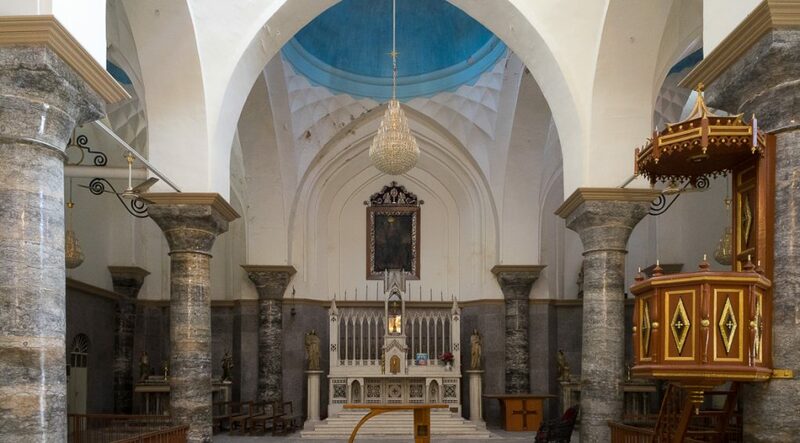 Church Um-Al-Ahzan in Baghdad. 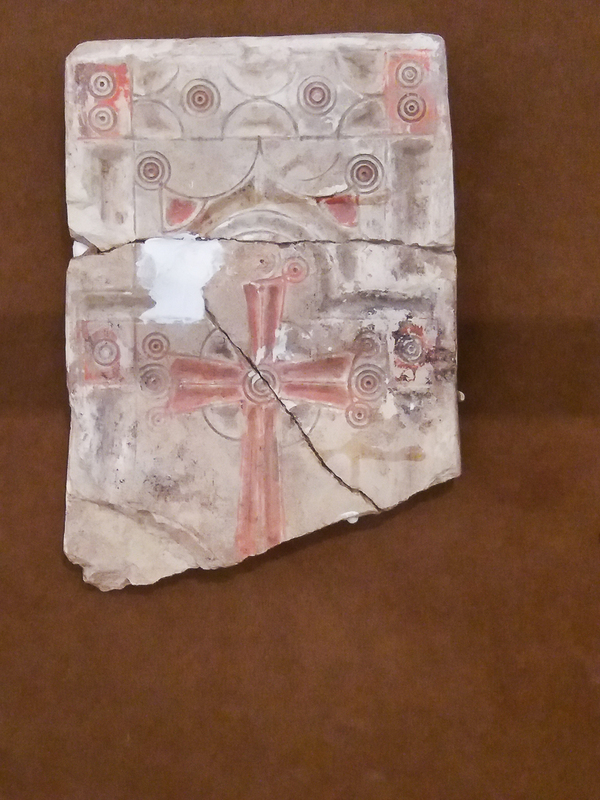 Ornaments under the western gallery. Church Um-Al-Ahzan in Baghdad. Votive candles next to the southern entrance door. 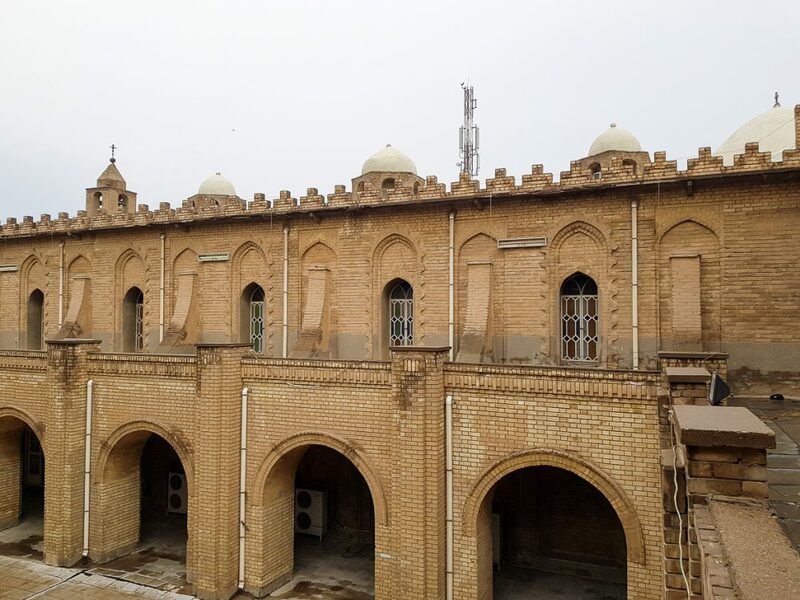 The Chaldean church of Um-Al-Ahzan is a beautiful terra cotta building, following an ancestral and typical construction method in Mesopotamian style, which was used until last century to build houses, mosques, churches and palaces in Baghdad. 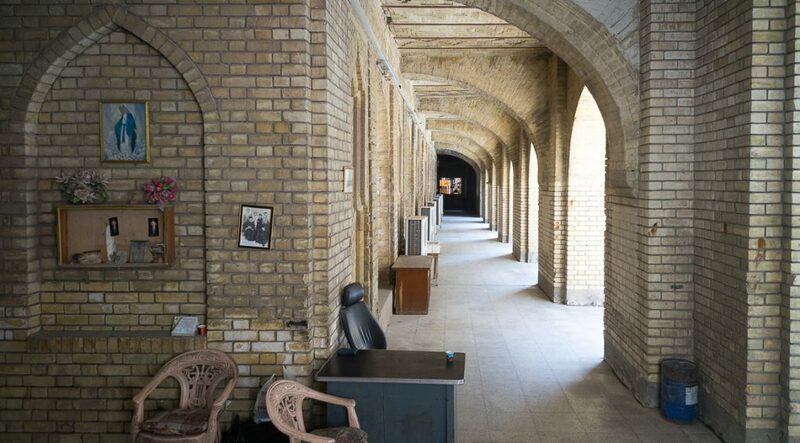 The very thick walls helped keeping in coolness in the summer and heat in the winter. 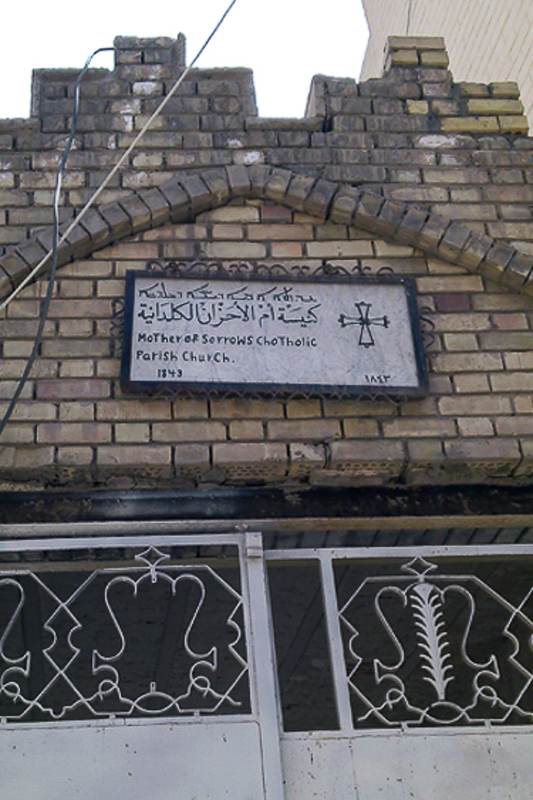 A modest sign above the outside gate shows the way into the religious compound. 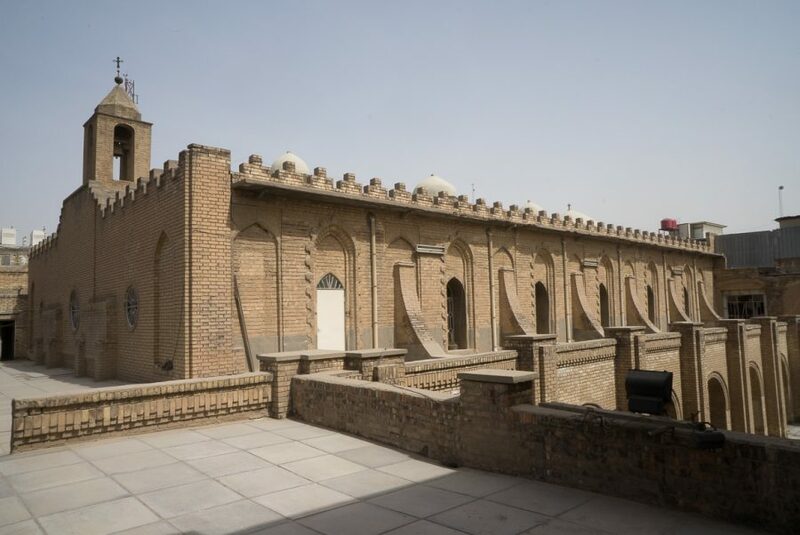 Getting through this surrounding wall gives access to a courtyard, which used to be a cemetery and at the end of which, on the back wall, some tombstones can still be observed, engraved with inscriptions in Arabic and French. 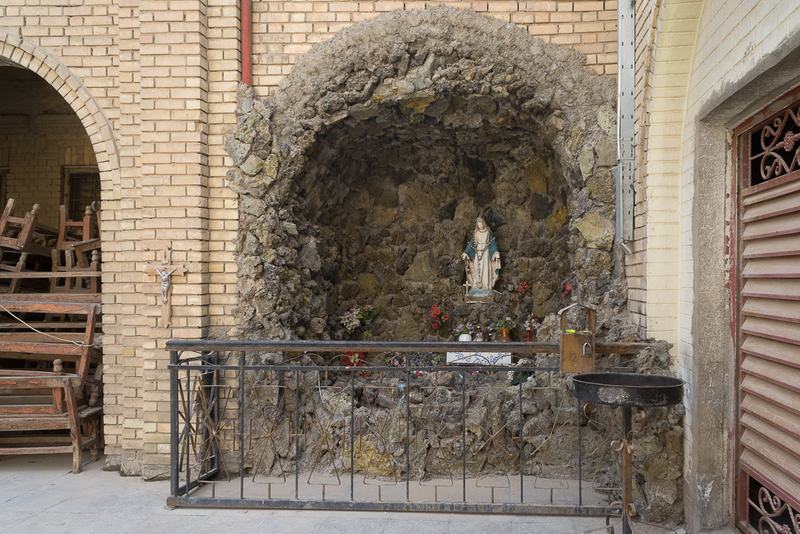 The southeast corner of this courtyard is adorned by a copy of the grotto of Our Lady of Lourdes, as it is often the case in most Catholic (Chaldean or Syriac) churches in Iraq. A modest side door, under the open gallery on the southern façade of the courtyard, gives access to the church itself. Another larger door opens onto the northern façade of the building. 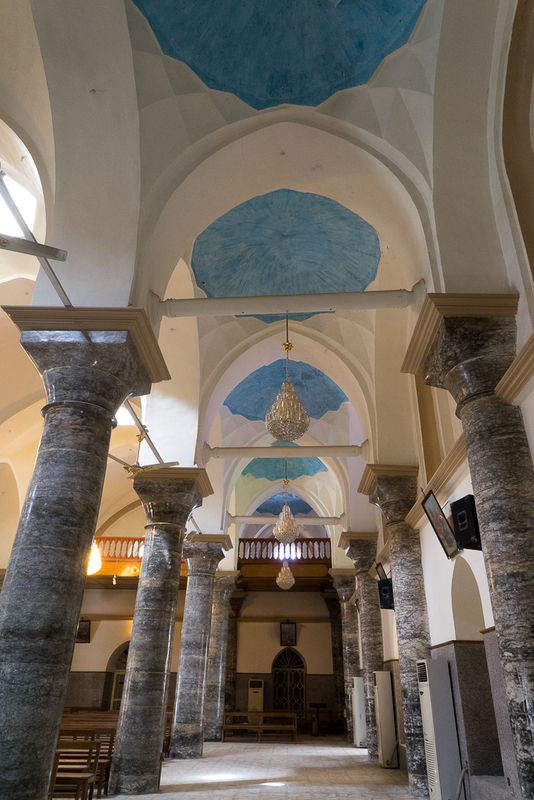 The church Um-Al-Ahzan, when seen from the inside, presents an ensemble of pillars and arches in Mosul marble. 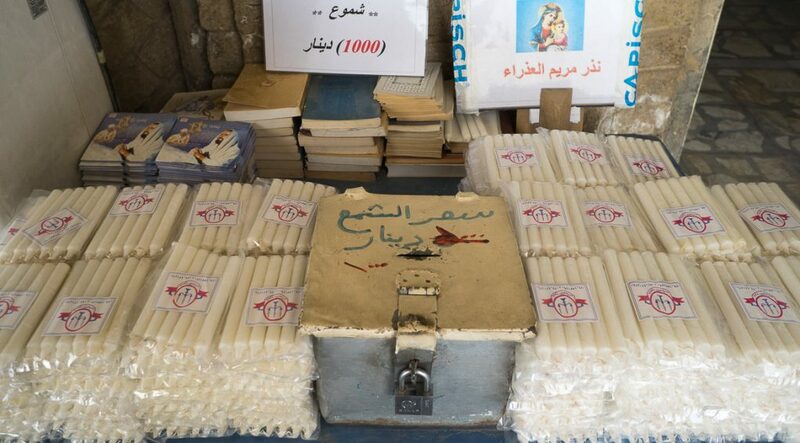 These materials were carried to Baghdad by keleks, rafts of inflated goatskins that used to go down the Tigris River. The whole structure makes up a building with one nave and 2 side-aisles, with the sanctuary taking up the whole southeastern width of it. 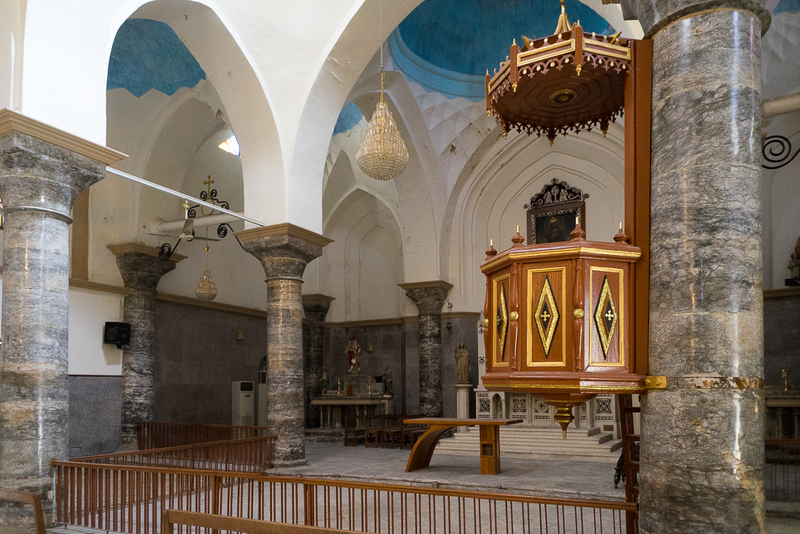 There is here no royal door separating the nave from the sanctuary as it usually is the case in ancient Assyrian-Chaldean churches, but only simple altar rails. The holy of holies consists in a double altar in the centre, topped with a cupola and two side altars, both topped with cupolas also. In its central part, the ancient high-altar backs onto the apse’s wall. It is a wooden, beautifully carved and decorated, high altar. 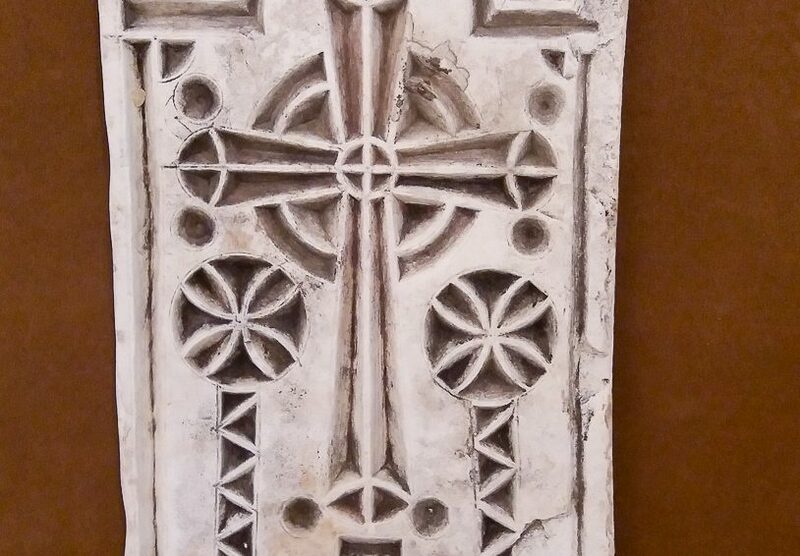 In gothic style, it has been crafted by Polish soldiers who arrived in Baghdad during WW2. 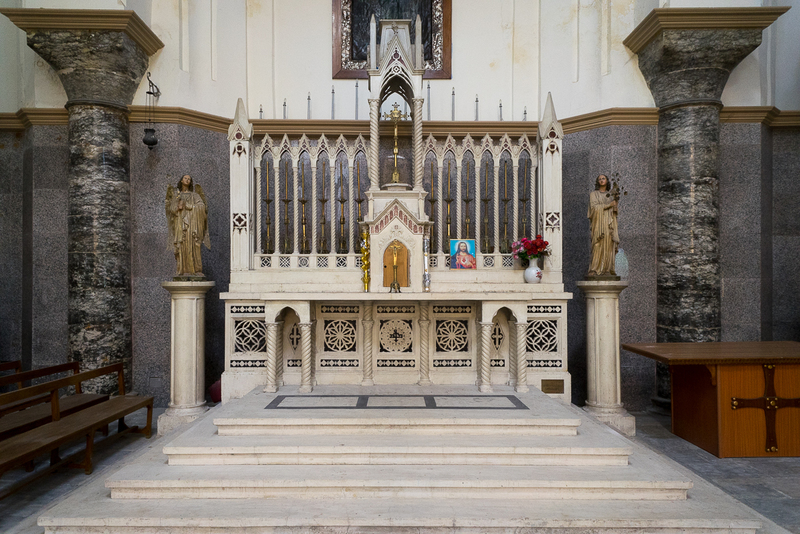 There is also another simple and modern free standing altar, also made of wood, placed right in the middle of the sanctuary and facing the worshippers, according to the tradition in Catholic churches since the Second Vatican Council. On the apse’s wall, above the ancient altar, hangs an outstanding painting, depicting the “seven wounds of the Holy Mother of God”. Its dedication and origin‘s indications are hammered in a cartouche in the lower part of the frame. The Arabic calligraphy indicates that it comes from Diyarbakır (southeastern modern Turkey) and that it had been transmitted (offered or made) by a man named Elias Gorgis in 1899. Both side-aisles of the church, narrower than the nave, are topped by a range of 6 small cupulas, supported by squinches, in shape of muqarnas (honeycomb structure). 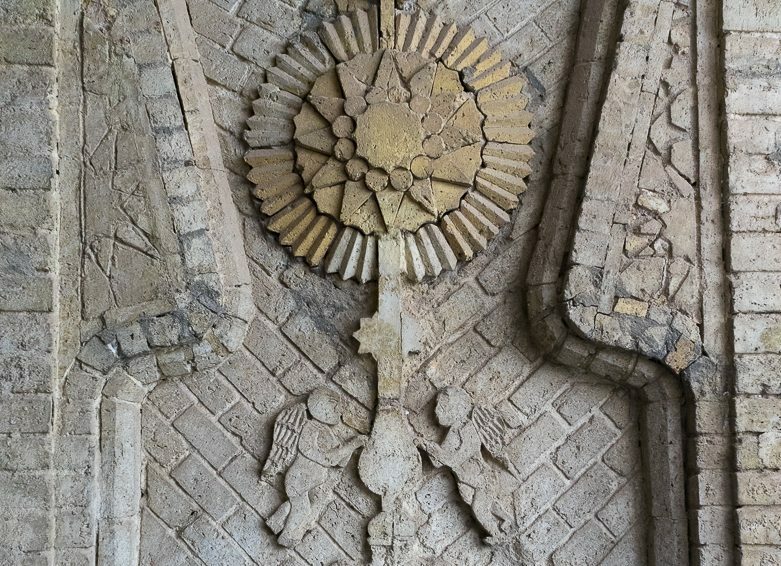 This is quite typical of Abassid and Persian architectural and ornamental styles. 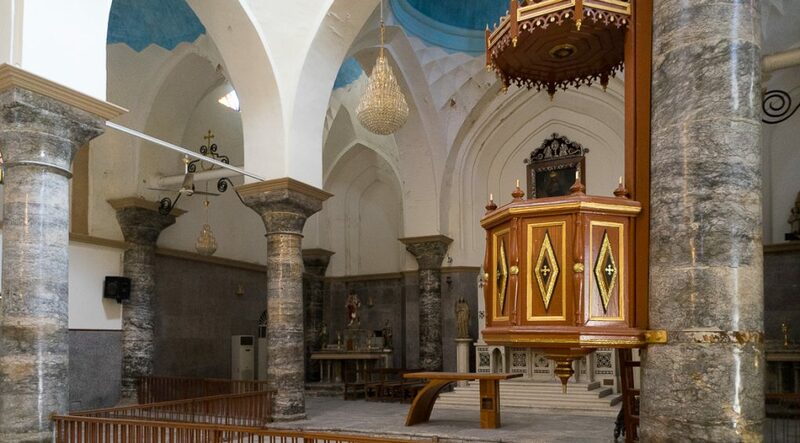 Offering an outstanding acoustics’ quality, the church Um-Al-Ahzan also presents a wooden carved pulpit, backed onto the right-side pillar ending the altar rails, which is all the more unusual in traditional architecture of Mesopotamian churches and reveals the influence of the Roman Catholic Church. Very close to the sanctuary, on either side, several gravestones can be observed. 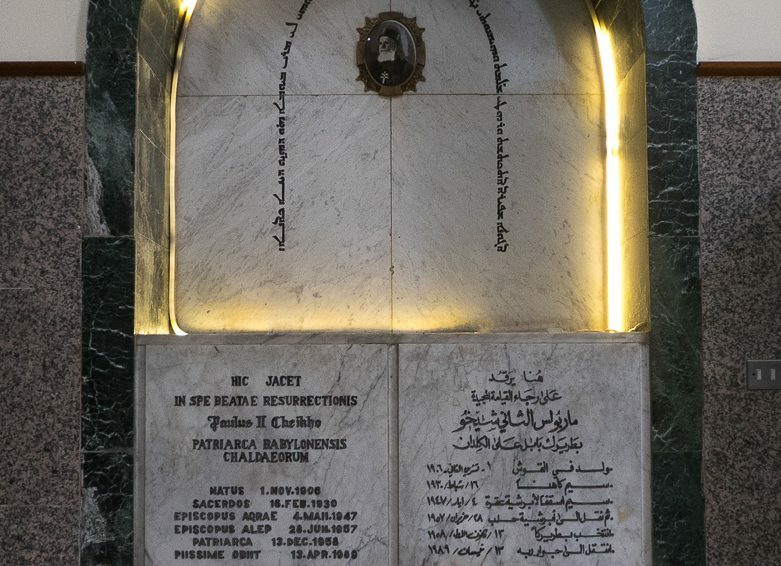 The most important one is the tomb of Patriarchs Abdisho V Khayat and Paulus II Cheikho. 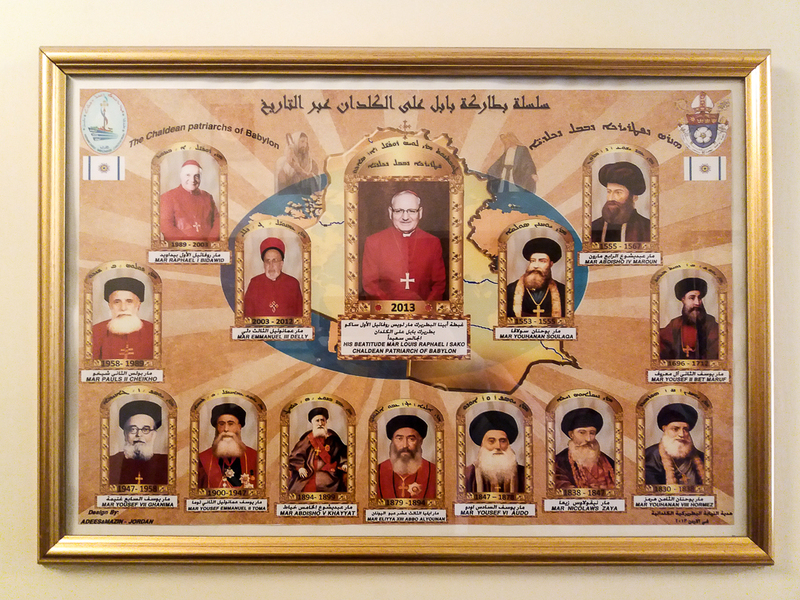 Bishop Mickael Naamo, who took a large part in the building of the church, and Father Mickael Baho and Father Youhanna Maqsoud are also buried there. 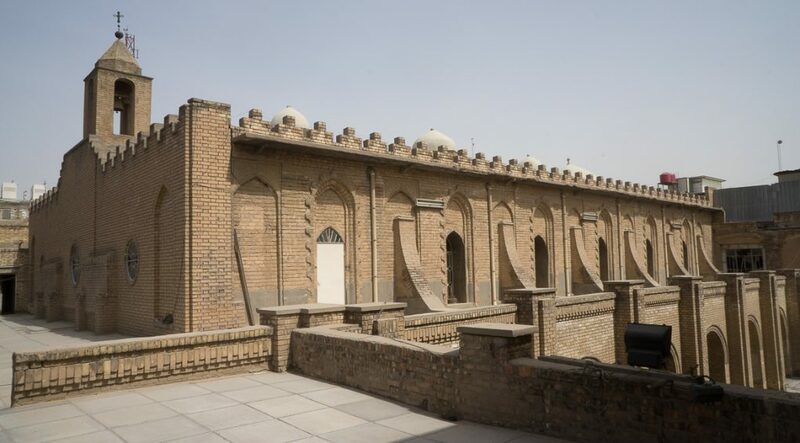 Outside the church Um-Al-Ahzan, on either side of the building, the northern and southern walls are adorned with bas-relief in brick, representing ancient crosses, mostrances and other religious ornaments. Church Um-Al-Ahzan in Baghdad. Southeastern view, from the terrace. 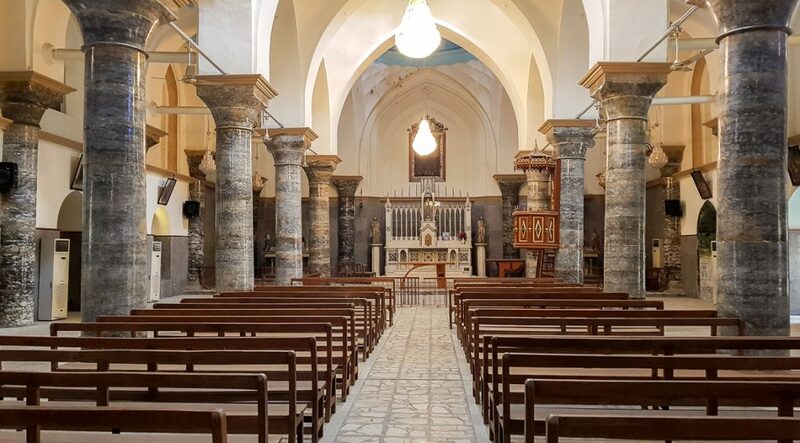 Church Um-Al-Ahzan in Baghdad. 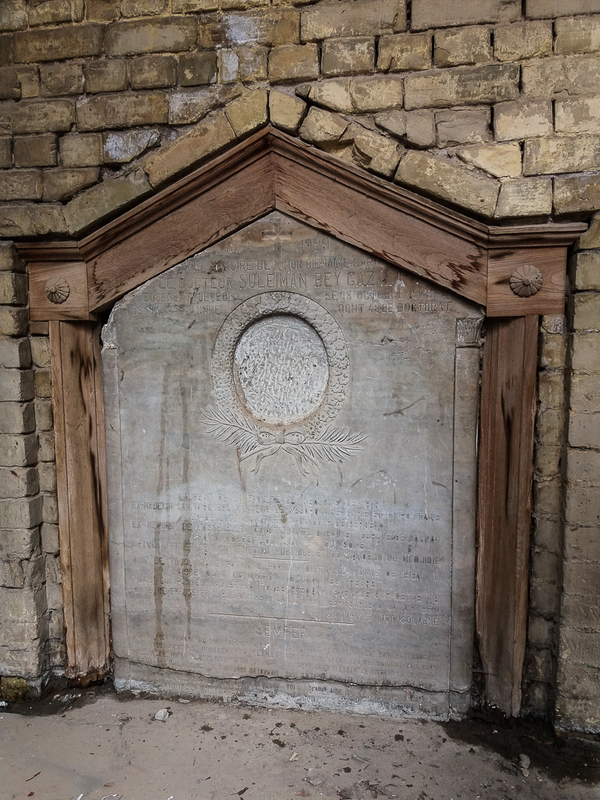 Gravestones in the church's courtyard, in memory of Doctor Suleiman Bey Gazala (1853-1929), erected by his widow who added a loving and poetic dedication. Church Um-Al-Ahzan in Baghdad. 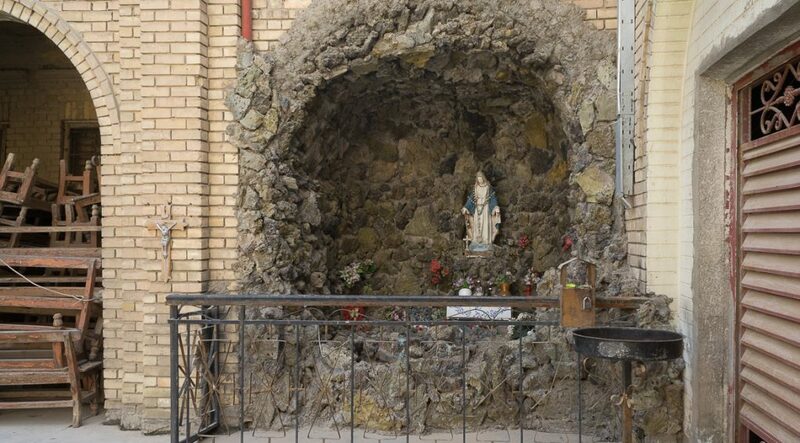 Reproduction of a grotto to the Holy Mary. Church Um-Al-Ahzan in Baghdad. Southern gallery. Church Um-Al-Ahzan in Baghdad. Inside view: nave, pulpit and sanctuary. Church Um-Al-Ahzan in Baghdad. The sanctuary with two altars, an ancient and a modern altar, as well as the wooden carved pulpit. Church Um-Al-Ahzan in Baghdad. 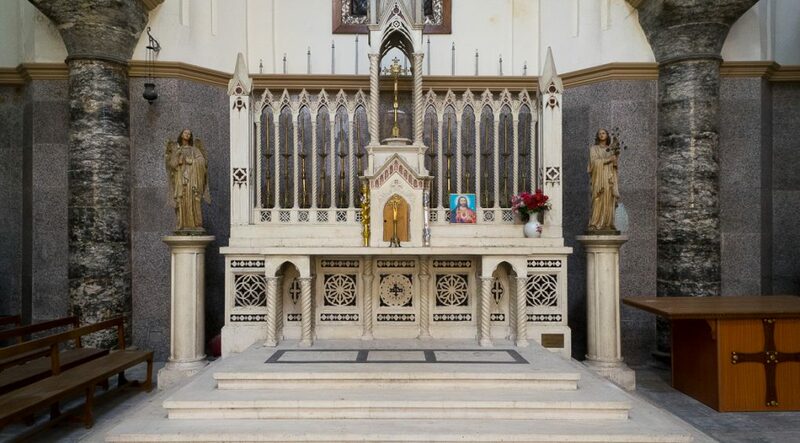 The former high-altar. Church Um-Al-Ahzan in Baghdad. 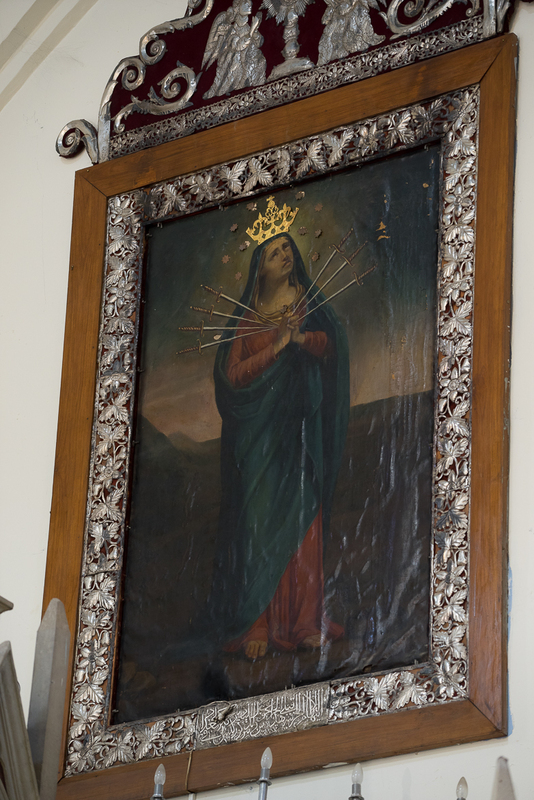 Painting of the Holy Mary of the 7 Sorrows with its dedication, hammered onto the lower part of the frame. Church Um-Al-Ahzan in Baghdad. Northern side-aisle. Church Um-Al-Ahzan in Baghdad. Wooden carved pulpit. 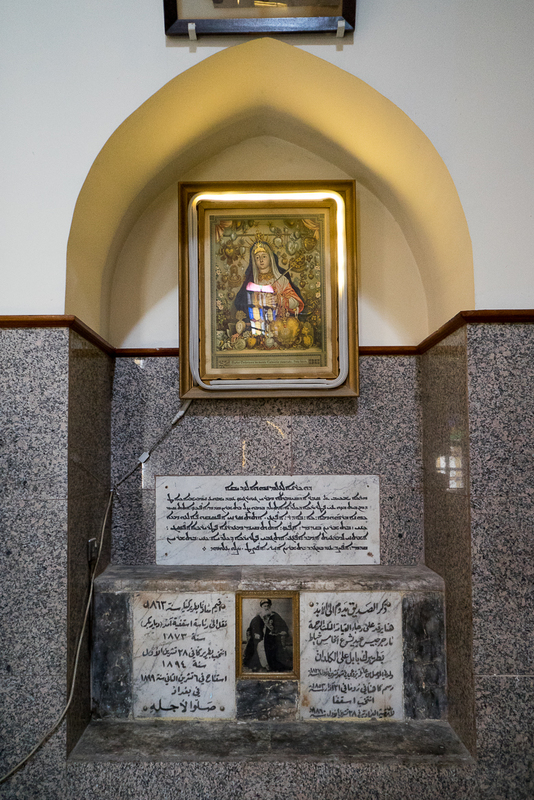 Church Um-Al-Ahzan in Baghdad. 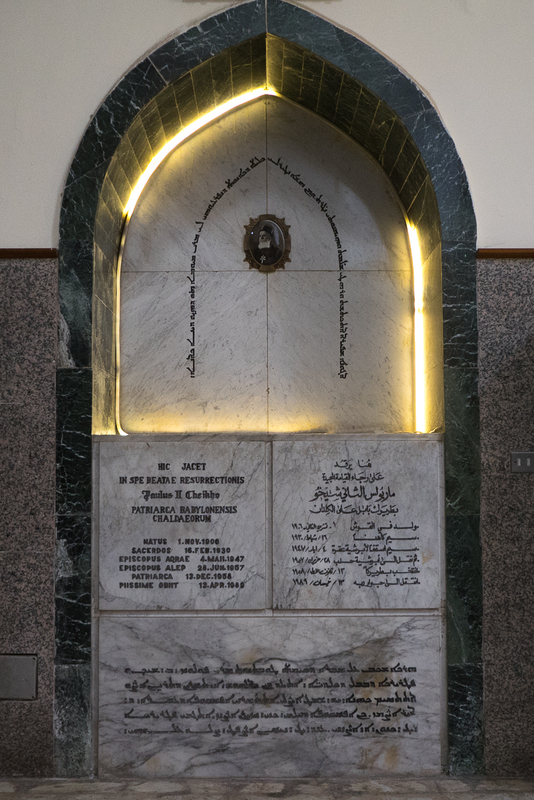 Tomb of Patriarch of Babylon for the Chaldeans, Paulus II Cheikho. 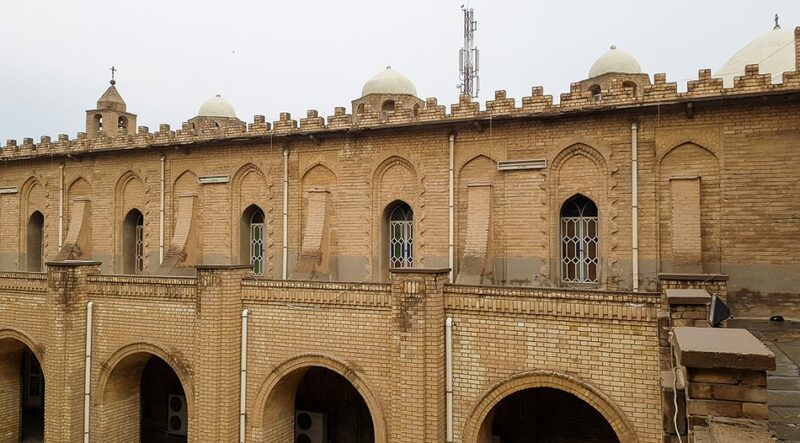 Church Um-Al-Ahzan in Baghdad. Headstone and tomb. Church Um-Al-Ahzan in Baghdad. 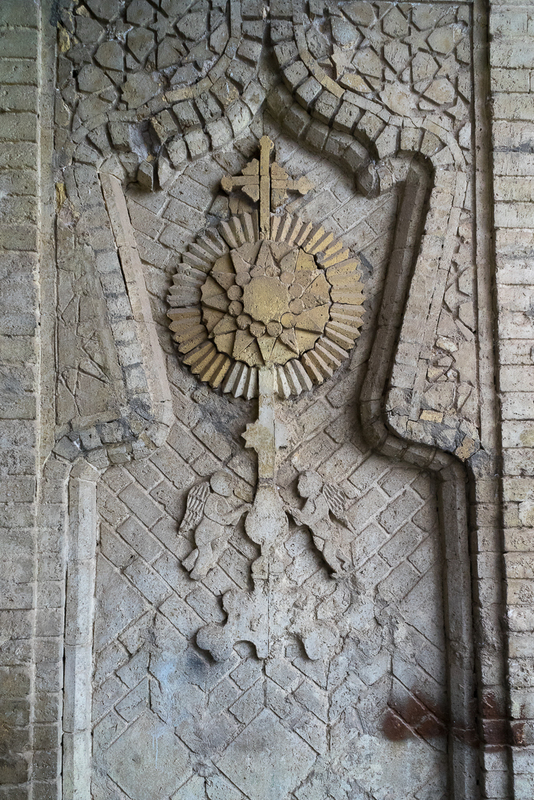 Bas-relief in brick representing mostrances. Church Um-Al-Ahzan in Baghdad. 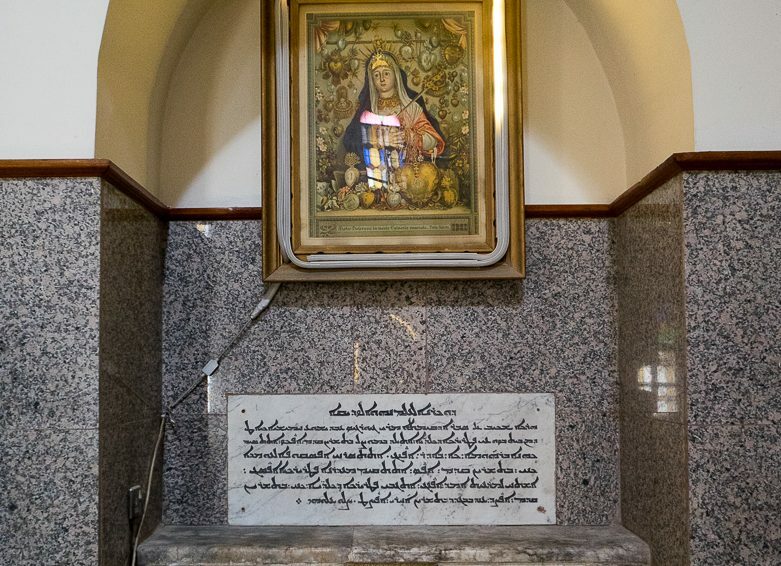 The Holy Mary is also revered by Muslim women.